From special ornaments we have kept from childhood, to the ones we’ve been given or found on our travels, we’ve amassed quite a collection. We enjoy decorating for the holidays each year, in part because our ornaments bring back so many memories and thoughts of our friends. 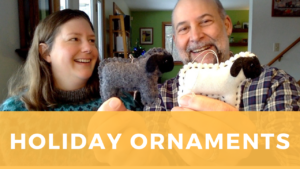 In the video we share a few of our favorites, including, a glass icicle from Zug Glass, and a felted cardinal from The Felted Gnome Knows. US H hook to work the butterfly. US B or small crochet hook for attaching the hanging thread. Small amounts of worsted weight yarn, about 10 yards per ornament. Ch 6 and join with a sl st to make a ring. Round 1: Ch 3 (counts as first dc), dc in ring, ch 2, then *2 dc in ring, ch 2* 7 times. Join with sl st to 3rd st of ch-3. Sl st in next dc. Round 2: Ch 4 (counts as first tr), 4 tr in 1st ch-2 sp, ch 1, then *5 tr in next ch-2 sp, ch 1* 7 times. Join with sl st to 4th st of ch-4. Fasten off. Weave in ends and trim excess yarn. Fold the crochet circle in half. Bend a pipe cleaner in half and slip it over the half circle so the U in the pipe cleaner is at the center of the curved edge. 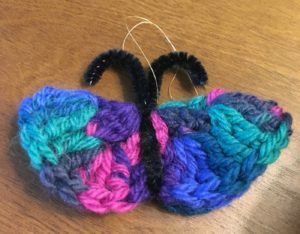 Twist the pipe cleaner and bend the ends to make “antennae” for your butterfly. Measure out a length of thread about 8 inches long and tie the two ends together. Using the small crochet hook, pull one end of the loop under the pipe cleaner and pull the looped thread through itself to attach to the ornament. Hang on a garland or tree and enjoy! *Special thanks to Michael Hampton for proofreading and correcting this pattern. Next Article Next Article: Swedish Cardamom Bread is a delicious holiday treat that makes a great gift.